Mix the sour cream with ranch dressing mix in a bowl until smoothly combined. Add the cream cheese and Cheddar cheese to the bowl, and mix together with your hands until thoroughly blended. Chill the mixture for 5 minutes, then shape into a ball. 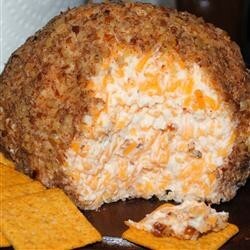 Place the pecans into a shallow bowl, and roll all sides of the cheese ball in the pecans to coat. Serve immediately.